People who object to proposed real estate projects are often called NIMBYs (Not in My Backyard), and they can be the bane of economic development planners, elected officials, land owners and construction contractors. But highly motivated development critics believe they act as civic-minded residents seeking to fend off greedy and possibly politically connected investors. Land use law in many jurisdictions offers abundant guidance on the boundaries between community interest and private property rights. Yet the process for approving projects typically also provides for public comment. And the ability to speak out about proposed developments is as sacrosanct in American public discourse as the First Amendment itself. In some instances, proposals with a clear right to proceed have been crippled by vocal protests, however thinly based; in others, citizens with legitimate concerns have been dismissed as ill-informed fuddy-duddies. One man’s NIMBY may be another’s Jane Jacobs. Perhaps the first reference to the term “NIMBY” came in a Nov. 6, 1980, Christian Science Monitor article (“Hazardous Waste”) about a proposed landfill, although no one appears able to identify who actually coined the term. Considering how apt neighbors are to annoy each other, it seems strange that a shorthand way to describe the phenomenon arrived so recently. One purpose of this analysis is to offer a more useful definition of NIMBYism than the vague one advanced by Merriam-Webster—“opposition to the locating of something considered undesirable (such as a prison or incinerator) in one’s neighborhood.” The lexicographers here sought to remain neutral on whether NIMBYism is a positive or negative thing. But although the acronym may sound quaint and benign, it can signify much more than just a grouchy neighbor. NIMBYs can and do sometimes wreck worthwhile projects with years of planning and earnest commitments behind them based on little more than a whim or in the worst cases cultural animosity. A better definition that distinguishes between legitimate and bogus opposition might read as follows: Opposition to a development that places an individual’s perceived interests above those of the larger community. Another goal here is to help economic development professionals understand when opponents point out the down side of a project the developers have not considered, and when their complaints simply reflect a personal prejudice. The article will discuss a spectrum of cases that fit between these two poles. In doing so it will illustrate that the distinctions are not always clear-cut. 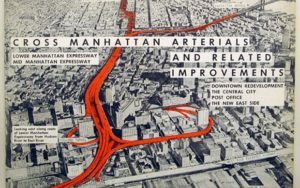 In one case, community activist Jane Jacobs certainly must have seemed to urban development juggernaut Robert Moses as the peskiest of all NIMBYs, but in the fullness of time she had a better argument against the Lower Manhattan Expressway than he had for it. A similar set of circumstances played out in the Los Angeles area when local opponents over several decades compiled a sloshing punchbowl of reasons not to conjoin two major roadways, but at the end of the day the project died because of the evolving Southern California urban landscape. In another case, protests that prominent Massachusetts waterfront residents have lodged against a proposed offshore wind farm serve as a flimsy, but well-funded argument against an infrastructure project with potential environmental benefits. Finally, the proposal for development at a Bay Area Rapid Transit station highlights the need for economic development professionals to get out in front of such projects with solid public education before NIMBYs tarnish them with rumor and misinformation. 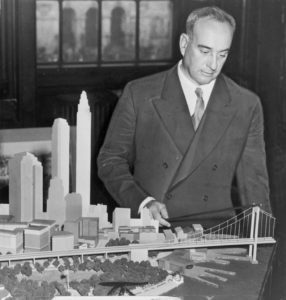 Among the most powerful figures in shaping New York City in the mid-20th century was Robert Moses. His vision of building infrastructure to advance the city’s immediate physical requirements and future growth potential netted impressive results. They included the United Nations headquarters, Shea Stadium, the Lincoln Center and hundreds of thousands of public housing unit. But his primary mark on the development of New York City came in the form of key bridges, tunnels and expressways (Throgs Neck, Henry Hudson, Bronx Whitestone and the Verrazano-Narrows bridges, to name a few). Moses also was the guiding force behind the Brooklyn-Queens Expressway, Staten Island Expressway and Cross-Bronx Expressway. The project that may stand as his crowning achievement was the Triborough Bridge complex of spans that connected Manhattan with the Bronx and Queens. Perhaps more important than the structures themselves was the Triborough Bridge Authority, which he headed and parlayed into a leviathan of political and financial power. Moses in large part controlled the tolls collected from the various traffic conduits and that gave him an outsized role in influencing what public infrastructure got built and where it was sited. In light of history, Moses could be seen as responding with good intentions to the unprecedented impacts of vehicles on the urban landscape. Remember that the car itself had been invented less than half a century before Moses planned some of his most consequential infrastructure facilities. He regarded himself as dealing pragmatically with the need to move people and machines throughout a burgeoning city, to ease congestion, to serve the good of the whole. Without debating the merits of Moses’s urban planning strategies, history has rebuked his arrogance as both a planner and decision-maker. He fought it out–and often won–with other New York power brokers and therefore saw little need for comment from or accountability to block-level interests. He became infamous for his reluctance to inform the public about his proposed projects and worked constantly to get them done without hearings or community input. That autocratic streak eventually ran headlong into an insightful and persistent opponent–author and urban intellectual Jane Jacobs. A neighborhood resident, she led a grassroots campaign against Moses’s late 1950’s proposal for a Lower Manhattan Expressway, which would move traffic from the Holland Tunnel through Manhattan to the Williamsburg and Manhattan bridges. Not only would the 10-lane highway require the demolition of 416 buildings, it would barrel right through Soho and Little Italy. In addition, the network of roads intended to feed traffic into the expressway would cause significant disruptions in nearby neighborhoods, including Greenwich Village, where Jacobs lived. No doubt in Moses’s eyes Jacobs must have come across as the ultimate NIMBY–an angry middle-aged housewife, albeit one with respected credentials as a writer with her own defensible view of her community. She, working as an activist with her neighbors, was able to enlist the support of media and important public figures and eventually defeated the expressway project. History’s verdict has upheld Jacobs and condemned Moses, as well as his heavy-handed approach to large-scale urban planning. 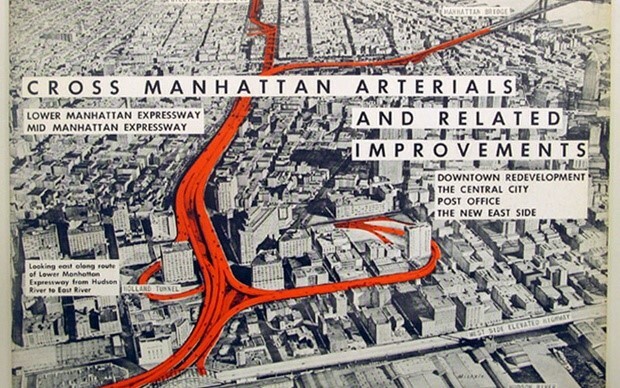 It is widely understood that the expressway would have sliced up, paved over and ravaged much of Lower Manhattan. Many other neighborhoods that had no Jane Jacobs to fight off freeway builders have sustained long-term economic and social injury from similar projects. What the episode established was the precedent–proof that citizens can stand up to powerful actors in urban development. Since then stronger requirements for adequate notice and opportunities for public involvement, particularly regarding larger development initiatives, have been enshrined throughout America. California highway planners have been trying to tie together the two loose ends of State Road 710 and State Road 210 for more than 60 years. In recent months planners finally may have thrown up their hands due in no small part to the efforts of ever-changing sources of opposition, but also due to the evolving urban environment itself. Both of these major sections of Interstate terminate in residential areas, with 210 extending from the San Fernando area to Pasadena and 710 originating at Long Beach and ending abruptly north of I-10 just east of Los Angeles. The two roads are essentially lined up to meet each other and need just a five-mile connection to provide a link between two of Los Angeles’s major east-west Interstate corridors. The absence of this final section of road has formed a bottleneck for truck traffic out of Long Beach and resulted in decades-long worries about air pollution and congestion. 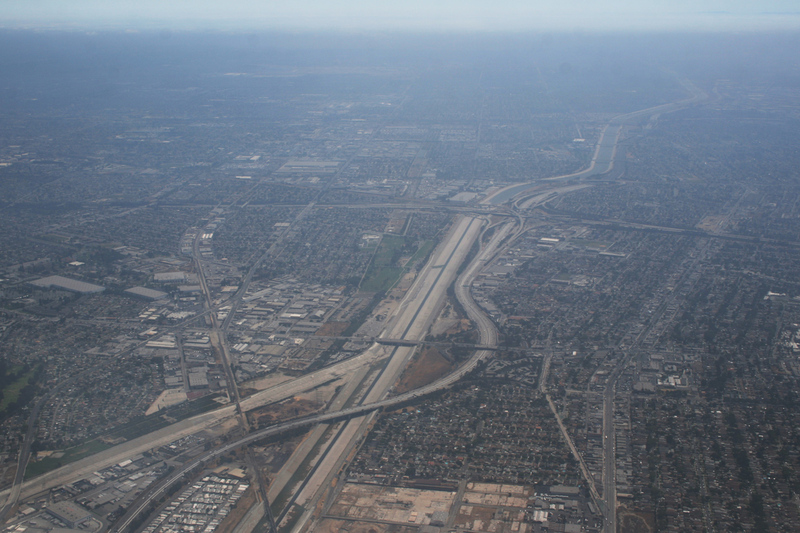 The 710 project had its origins in California highway plans dating back to the 1930’s. Actual construction began in 1951. In 1964 the California Highway Commission identified a route to extend the road through South Pasadena, and the California Department of Transportation (Caltrans) began acquiring properties along that route. After opening a new 1.3-mile section of the freeway north of I-10, the project stalled when opponents from South Pasadena objected. The project remained on hold for many years and in 1973, several groups, including the city of South Pasadena, took the issue to federal court, arguing for additional environmental study. The court subsequently issued an injunction that halted work on the freeway for 25 years. A more recent proposal would have built the 4.9-mile connection as a tunnel. In 1982, Gov. Jerry Brown signed legislation that would have countered attempts by South Pasadena to block the possible route. However, the legislation also called for additional environmental analysis, further delaying the project. Gov. Pete Wilson pushed for the freeway in 1992 and federal highway officials approved an environmental analysis. But El Sereno activists filed a 1995 race discrimination suit, charging that the route through an ethnic Latino neighborhood did not include the same noise mitigation measures that had been promised to South Pasadena and Pasadena. In April 1998 the Federal Highway Administration (FHA) reached a decision clearing the way for completion of the extension of 710. Later that year South Pasadena brought another federal lawsuit alleging inadequate environmental and historic preservation protections. U.S. District Judge Dean Pregerson in 1999 came down on the opponents’ side, ruling that Caltrans and federal agencies had failed to consider other options and may have violated the Clean Air Act. The decision again blocked progress on the freeway. In 2000 the Pasadena City Council dropped its support for the project and in 2003 even the FHA backed off its long-standing position and told Caltrans its 1992 environmental impact analysis was out of date. Meanwhile, 11 more historic sites were added along the projected freeway route. Support for the highway also was undercut when the LA Metro’s Gold Line, which runs through Pasadena, opened up. That relieved commuter pressure on the highway system in the region. Further, the Alameda Corridor freight line opened, and that also reduced truck traffic along 710. Highway proponents in 2008 had instituted a half-cent sales tax measure that had raised $780 million to build the estimated $3.2 billion tunnel and had sought federal support as well. But after decades of wrangling, the Metropolitan Transportation Authority (MTA) in May 2017 voted unanimously to pull its support for the project, effectively killing it. The long ordeal of the State Road 710 project is a case study in how NIMBYism sometimes can delay action on a development until the circumstances around it obviate the need it was designed to meet. In the context of the lattice-work of highways that move goods and people throughout the greater Los Angeles metropolitan area, the proposed link-up of 210 and 710 could be seen as a logical component of the larger road network. Yet the eventual extension of subway and freight rail service to the area, which had not been envisioned when the freeway was originally proposed, changed the facts on the ground. It meant the surrounding communities preferred the inconveniences that still exist in the area to the disruptions and expense of completing the development. At 4.5 miles out to sea, the proposed Cape Wind offshore windmill farm in the Nantucket Sound would hardly be close to anyone’s backyard. Like solar arrays, large-scale wind power generators hold appeal as an ecologically sound alternative to fossil fuels. But both technologies involve intensive networking and delivery systems in addition to the sizable structures themselves. They are hard to hide, though many don’t object to their presence and some find the windmills or solar arrays appealing as a manifestation of renewable energy. When Cape Wind Associates introduced the 130-windmill project in 2001, it had lined up financing for the $2.5 billion construction cost from the Bank of Japan-Mitsubishi UFJ. The facility would be designed to supply about 1,500 gigawatt hours of power annually–75 percent of the average electricity needs for Cape Cod, Nantucket Island and Martha’s Vineyard. Cape Wind notes that its generators would directly reduce carbon dioxide released by a million tons annually and offset the burning of 113 million gallons of oil currently used to generate electricity to the area it intends to serve. They would also avoid the hazard of oil spills, which had been a concern locally in the past. The plan sailed through the initial certifications from state agencies. Cape Wind won approval in 2005 from the Massachusetts Energy Facilities Siting Board (MEFSB) to undertake construction. In 2007, it got the go-ahead from the Massachusetts Secretary of Energy and Environmental Affairs. In October 2007, the Cape Code Commission, whose approval the project needed, decided not to green-light the proposal without further study of its impact. The MEFSB overruled the Commission in May 2009, issuing a “Super Permit” to Cape Wind that superseded all state and local approval requirements. Responding to legal challenges, the Massachusetts Supreme Judicial Court in August 2010 ruled the state has the authority to reject local opposition to the project. Cape Wind anticipated relatively quick federal approval when it applied in 2001 to the Army Corps of Engineers for a permit. However, authority in such matters was shifted to the Interior Department’s Mineral Management Service, and that slowed down the process. Also, the National Park Service listed the area envisioned for construction on the National Register for Historic Places because of its cultural and spiritual importance to two Native American tribes. After years of hold-ups and objections, then-Interior Sec. Kenneth Salazar in April 2010 gave the federal government’s final go-ahead. Cape Wind secured additional permits from the Corps of Engineers and the Environmental Protection Agency in 2011 and won approval from the Bureau of Ocean Energy Management, Regulation and Enforcement, also in 2011. 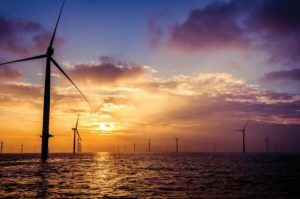 Cape Wind had reached a unique arrangement with National Grid, an investor-owned energy company, to purchase half of the wind farm’s electric production. It also signed an agreement in 2012 with NSTAR, now merged with Northeast Utilities, for another 27.5 percent of its production. Both contracts were terminated in 2014 after Cape Wind, beset by legal challenges, lost its financing commitments. Among Cape Wind’s legal headaches was a 2016 DC Circuit Court order that vacated a 2009 Department of Interior Bureau of Ocean Energy Management (BOEM) Supplemental Environmental Impact Statement (SEIS). The order called into doubt whether the sea floor could adequately support the wind turbines. The BOEM issued another SEIS addressing the Court’s concerns shortly after a two-year suspension of a lease with the Bureau expired in July 2017. Cape Wind had requested the suspension while it dealt with legal challenges. Although prospects for Cape Wind remain in doubt, BOEM in September 2017 issued a decision on the sea floor issues and reaffirmed the long-term lease of the 46-square mile project area in Nantucket Sound. Cape Wind has enjoyed support from regional advocates of alternative energy such as Clean Power Now of Hyannis, Mass. And it has the backing of the Sierra Club, Greenpeace and the Natural Resources Defense Council. But it also has had opponents, including fishermen, local towns and the Wampanoag Tribe of Gay Head. From the beginning, however, the most concerted opposition formed behind a phalanx of powerful, wealthy and well-known personalities. It was a bipartisan group that included Walter Cronkite, Ted Kennedy, Robert F. Kennedy Jr., John Kerry, Mitt Romney and William Koch. A scion of the Koch Industries empire, Koch donated $5 million to the Alliance to Protect Nantucket Sound and has been regarded as its ringleader. The Alliance and others have raised many legal challenges to Cape Wind–concerns about environmental impact, effects on fisheries, desecration of traditional tribal areas, cost of the electricity. Yet the most high-profile issue from the beginning has been what the opponents believe is the proposed windmills’ high profile. The luminaries who formed the Alliance have contended the presence of the turbines would ruin the scenic views from their oceanfront properties. Many of the issues have been resolved in Cape Wind’s favor, but it has cited the expense and delays caused by lawsuits as roadblocks to its success. Analyses of the Cape Wind controversy place much of the blame for its woes on James Gordon, who headed up the project. He has been criticized for his management and promotion of Cape Wind and for failing to deliver on promised outcomes. Still, Cape Wind highlights the question of what constitutes “visual pollution” and whether such a subjective consideration should have a bearing on the approval process for major development projects. 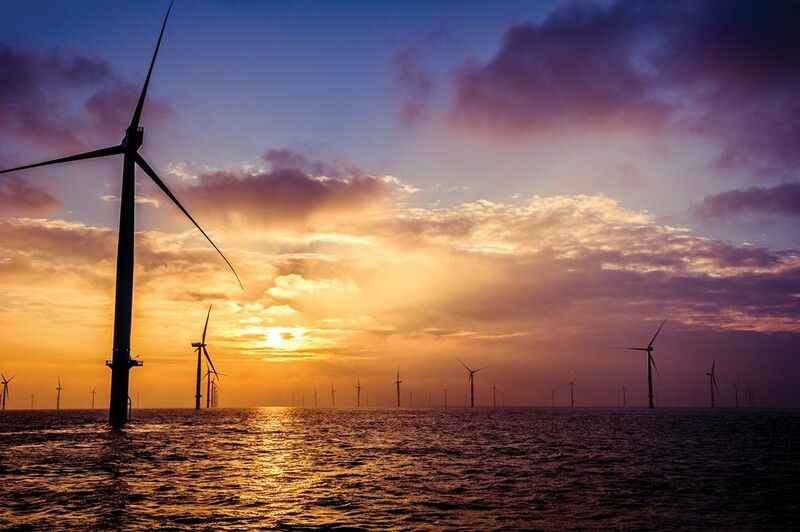 Cape Wind was to be the first significant American offshore wind farm project. At least seven others have been under consideration, mostly along the Atlantic coastline. In May 2017 a much smaller wind farm off the coast of Block Island, RI, comprising only five generators, became the first operating American offshore wind farm. The sorts of concerns expressed about the Cape Wind proposal appear not to have scotched offshore wind power in Europe. Windeurope, which tracks the wind electric generation sector, reported in a January 2017 analysis that 3,589 wind turbines in 10 European countries. 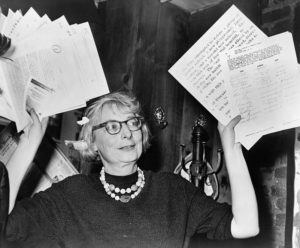 Jane Jacobs became a hero and icon; her example has been followed by countless activists who also see their neighborhoods as under attack by over-aggressive developers. Whereas Jacobs’s cause related to a sprawling, multi-faceted project and its impact on a huge swath of Manhattan, many who emulate her appear to tilt against a single windmill (or apartment building) fearing projected harm made up of whole cloth. The urge to oppose can be so strong, it takes on a logic all its own; it can even override the objector’s own best interests and ideological tendencies. Transit-oriented development (TOD) projects, a subset of the overall Smart Growth school of thought, emerged from a concern about limiting sprawl and improving access to often underused public transit facilities. More often than not, the TOD proposals came along well after the transit nodes themselves were built. That meant areas immediately adjacent to the stations often were zoned for lower-density land uses such as single-family housing. In addition to the 18-story housing facility, the plan included the rebuilding of an aging theater and a $10 million contribution to the city’s affordable housing fund. 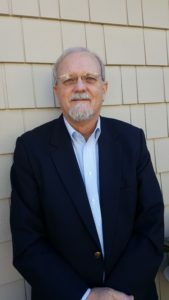 Mark Rhoades, whose company won the contract to build Berkeley Plaza, pointed out that from 1970 to 1995 Berkeley added only 600 units to its housing stock. “We’ve gone through 36 public hearings leading up to (the project’s approval) and it seems like the people who came here in the 1960s and 70s have decided to freeze things just as they are,” Rhoades said, adding that the protesters typically were older, white property owners. “It became extremely apparent that all of the opposition, with the exception of two people, were over 60 and white,” he said. Specific objections to building the Berkeley Plaza were that it was “bland and unattractive,” that it failed to conform to surrounding structures, that it threatened the landmark status of the nearby historic Hotel Shattuck and didn’t adequately take into account wind velocity. Further, opponents said, the plan didn’t properly account for effects on a nearby high school, including health impacts on students, traffic and even on faculty parking. The Berkeley City Council approved the project in December 2015 and in October 2016 Alameda County Superior Court Judge Frank Roesch rejected petitions brought against the project, clearing the way for construction to begin. It is expected to be completed in 2021, at least 20 years after the city signaled an interest in developing the Ashby BART parking lot site. Berkeley Plaza is hardly the only Bay Area TOD to encounter NIMBY opposition. Similar concerns have been raised about projects associated with the BART stations at the MacArthur and El Cerrito stations and several other stops throughout San Francisco. Local opponents also have tried to stop the redevelopment of the U.S. Navy base on Treasure Island in San Francisco Bay, a mixed-use development project in Menlo Park, and a senior house facility in Palo Alto to name a few. (Similar instances of opposition to TODs have cropped up around some stations in the Washington, D.C., Metro system.) In each case, local authorities expressed a need to raise density in the interest of addressing sprawl and creating more affordable opportunities available for local residents. Those who decry a proposed development tend to see themselves as defenders. Even if the defender, like Koch, is a billionaire himself, he assumes the role for public relations purposes of the crusading underdog. In reality the developer usually does have more economic wherewithal than a single aggrieved citizen or a small ad hoc group but hardly holds all of the political cards. Jacobs possessed superior skills at local organizing, enlisting support for her cause among key neighborhood residents, including Eleanor Roosevelt. She also knew how to attract sympathetic publicity. “Jacobs cultivated the media in all its forms, garnering the support of independent press such as the nascent Village Voice,” according to a Guardian history of the Lower Manhattan Expressway. Not only small, alternative papers, but the sophisticated New York media broadly covered the matter. In some cases, opponents may only need to win over a few key journalists. Local media employ reporters and editors who are savvy about the area’s real estate market and political players but have little training in urban planning or land use law. And a complaint against a developer often plays as a David versus Goliath conflict, regardless of the merits of the dispute. Activists may well regard themselves as following in the well-known tradition of Jane Jacobs, even though the circumstances of the project they oppose are far afield from those facing Lower Manhattan in the late 1950s. Whereas a major highway project there certainly would have sundered several neighborhoods and sacrificed a thriving cultural Mecca to the needs of automobiles, today’s TOD projects may have the opposite effect. Opponents imagine ruinous changes and fail to appreciate the benefits of increased public transit and walkable neighborhoods. A Jan. 20, 2006, report in the Berkeley Daily Planet (“Neighbors Oppose Ashby BART Project”) on a neighborhood discussion of the Ashby station proposal, which was still in the conceptualization stages, typifies the kind of group-think that can overtake such an initiative. The meeting attracted about 400 attendees, many of whom voiced a wide variety of worries about the mixed-use plan for commercial facilities and 300 housing units. Most who protested had no specific concern about the project design, which didn’t even exist yet. They just didn’t like the idea of changing the landscape around the station. “…by the time the meeting ended, 220 of them had signed a petition calling for rejection of a CalTrans grant application that would provide $120,000 to develop a project plan,” the Daily Planet report said. 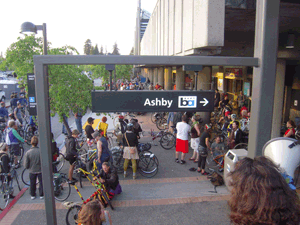 “I want a moratorium on any development at Ashby BART,” said another. Among the least reconcilable conflicts for TOD opponents is the relaxation of existing height and bulk regulations. Taller buildings in particular appear to trigger the most fervid responses from activists, even if they are stepped back from single-story structures. They do cast shadows, after all, and they frequently are described as an imposing presence, even if they are only one story taller than the nearest structure. Building height has become conflated in the minds of anti-development groups with an affront to the environment. The green space (or maybe the abandoned gas station) they revered is not just paved over, it has layers of steel and concrete stacked on top of it. As that formulation takes root activists often reject contradictory evidence that increased density, which comes along with height, actually preserves green space while reducing sprawl and its attendant insults to the environment. In Lewis’s book, Tversky noted that, “Because metaphors are vivid and memorable, and because they are not readily subjected to critical analysis, they can have considerable impact on human judgment even when they are inappropriate, useless, or misleading. This may help explain why people with primarily progressive social policy instincts put up a fuss about a proposed apartment building. They may feature themselves as Jane Jacobs, but their behavior more closely resembles that of Orval Faubus. Many also carp about prospective damage to their property values, further underscoring an exclusionary subtext to their arguments. Actually, the experience of TODs so far has been that they boost nearby property values. Of the four cases presented here, the Lower Manhattan Expressway experience offers the best example of legitimate, grass-roots opposition to a top-down transportation plan. Jacobs and her allies were not just kibitzing about a moderate-sized project developers wanted to build on their own land. They were fighting the dismemberment of an already densely populated area that would affect perhaps hundreds of thousands of people. The expressway would have split up entire communities that had long before formed personal and economic connective tissue. Ultimately, Moses needed a better argument than the necessity of moving cars from New Jersey to Queens and Brooklyn. In contrast to the Lower Manhattan case, the State Road 710 plan probably had a stronger rationale in part because it had been on the drawing board at a time when that sector of the Los Angeles metropolitan area remained only partially developed. Still, the outcome may have been fortuitous simply because of other changes in the transportation grid that alleviated demands on the existing highway system. In short, the project may have been done in not by a visionary but by NIMBYism. Yet in this case the NIMBYs may have been vindicated. The legal battle brought against Cape Wind represents an egregious example of NIMBYism. The Alliance to Protect Nantucket Sound members expect public utility decisions to account for their aesthetic sensibilities, even if they run counter to much larger public benefits. Anyone who dislikes a development has a right to have his or her say. Yet economic development officials can and should play a role in working with the community to explain the benefits of projects that have committed funding and that meet appropriate development and urban planning standards. Too often this outreach function occurs far too late in the process, with development spokesmen in a defensive crouch before an angry audience. Instead of establishing a policy framework to integrate existing neighborhoods with plans for higher density development at intermodal hubs, governing bodies tend to simply react to events. A proposal posts on a city council agenda, skeptics raise criticisms and the leaders must choose a side. If they vote in favor of the development, they may be accused of selling out to campaign contributors (and of course those shenanigans have been known to happen). But city halls that are not simply corrupt find it difficult to convince the public they can give balanced consideration to a development plan. Leaders like those dealing with the Berkeley Plaza proposal may see the long-range advantages of a design presentation, but the number of pro-development speakers at a hearing (often limited to the developers themselves) can easily be shouted down by an opposition group. Developers rarely work ahead of time with the small community organizations that could be enlisted to back a project if they had a better understanding of it before it reaches a zoning board. In fact, municipal governing bodies should formulate a policy that enunciates the general type and scope of TOD projects they will consider before one appears on their docket. Economic development professionals also should be prepared to make an honest argument that presents a full and realistic picture of expected outcomes. TOD projects often are sold as an urban renaissance. Their proponents note that they will limit the number of parking spaces at the new housing facilities, thereby attracting tenants who will commute by mass transit, walk, bicycle or telecommute. All of that may be true up to a point. But doubters will squint at projected traffic studies and predict the reality will be less utopian. Some of the data suggest they may have a point. An analysis of Portland, Oregon’s commitment to Smart Growth resulted, as expected, in higher population density and reduced per capita use of vehicles. And yet, it also generated more auto traffic around the transit nodes because of the population increases. That hardly suggests Portland’s experience has been a failure; it is still in the early stages of its decades-long Smart Growth strategy. It does imply, however, that TOD should not be sold as all rainbows and no rain. Economic development professionals should be aware that opposition to construction projects can take many forms and can have varying degrees of merit. It may be useful to consider these four examples to pinpoint the difference between complaints that are purely frivolous and motivated by personal bias from those that stem from concerns about material harm to individuals and communities. Planners need to understand that, like NIMBYs, they also can be subject to the syndrome described in “The Undoing Project” and interpret all objections as the gripes of dilettantes. In virtually all instances, reliable information, transparency and public education are the best safeguards against long-term strategic errors. 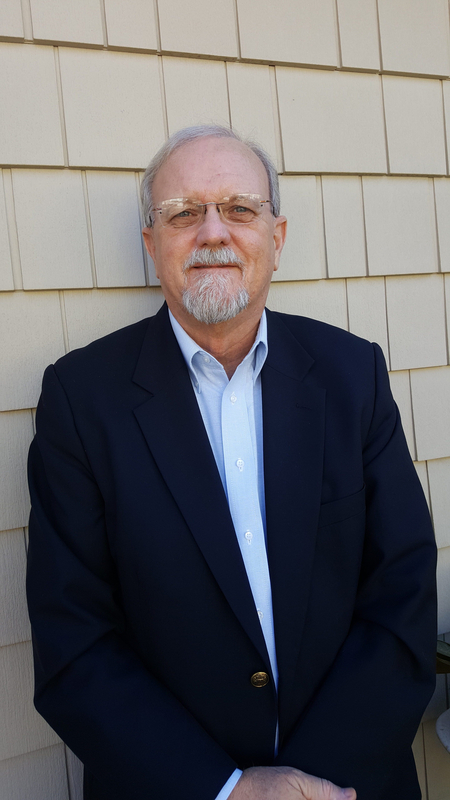 Richard Cowden is a journalist and urban planner. He retired in 2015 as a managing editor who covered financial services and commercial real estate law at Bloomberg BNA. As usual, “economic development professionals” in this context work for the built environment/commercial real estate agenda, and the locals who fight for better quality of life and living standards are called “activists”, a pejorative term meant to portray them as agitators. Let’s stop this abuse of planning terms. Let’s use the “economic development” term to denote advocates for human capital development, which includes quality of life & standards of living outcomes & metrics. Let’s also stop defining neighborhood or community “success” in business terms, rather than in socioeconomic terms. After all, “economic development” is a public term, not a private one. If you want to promote business development, join the Chamber of Commerce, as this is their mission in life. The mission of planning professionals is to improve people’s lives, where needs are greatest. Perhaps it is up to editors to do this job. Why allow for the abuse of an important planning term to be used incorrectly, article after article? In my long career I have helped stop nuclear waste dumps, mega ports, and baseball stadiums. I do it because the projects benefit rich powerful people while harming communities. I also attack the whole nature of economic development as practiced in my community, which is focused on giving tax breaks to the rich to build in ways that displace comunity members (gentrification) or subsidize the growth of industries that bankrupt communities. Simple facts, like using the medical industrial complex to grow the economy means no one can afford healthcare are simply not part of the economic development process. So we fight. We lose sometimes, like when we tried to stop the hospital from running over the neighborhood, but often the idea is to slow down the train long enough for the rich assholes to do stupid things, like is going on with efforts to build a new fracked gas power plant in Rhode island. And in my neighborhood we do understand the difference between private nimbyism, and protecting the neighborhood. We are very clear about crossing ethnic boundaries and working to protect the poorest and weakest in our communities from the most dangerous stuff. Dumping in Dixie is a real thing, the poor and people of color have always been saddled with the most toxic stuff, and we are committed to ending the process. The real issue is who is development for, the community or a very small powerful clique? If all the benefits go to the few, we fight.